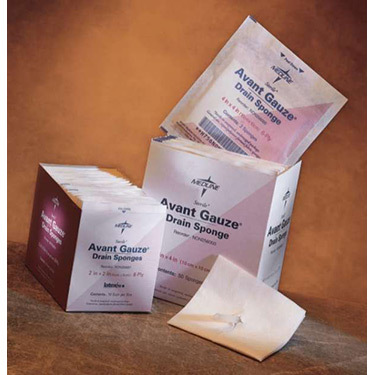 AVANT GAUZE DRAIN SPONGES: THIS SPONGE FEATURES AN EXTRA FENESTRATION WHICH ALLOWS IT TO LAY FLAT WHEN WRAPPED AROUND A DRAINAGE TUBE. WITHOUT IT, THE SPONGE WILL PUCKER, DECREASING EFFECTIVENESS BY ALLOWING FLUIDS TO POOL AROUND THE DRAIN TUBE. IT\'S A SIMPLE FEATURE THAT MOST OTHER DRAIN SPONGES DO NOT OFFER. INCLUDES ALL THE BENEFITS OF NON-WOVEN AVANT GAUZE. EACH 6-PLY RAYON/POLYESTER SPONGE IS HIGHLY ABSORBENT, LOW-LINTING AND FAST WICKING TO WOUND BEDS. 4 X 4, 6-PLY, STERILE 2\'S. Sponge is slit. Saw no difference from these to the ones I use, was disappointed.